Do you remember the story of Jesus raising Lazarus from the dead (John 11)? It is a very profound story in many ways. First, it is a sign of Jesus’ divine nature – only God can bring a dead man back to life. Second, it shows the compassion of Jesus – before He raised Lazarus, He mourned over him and the loss to his sisters (“Jesus wept”). But one really neat item is HOW Jesus performed the miracle! Before Jesus raised Lazarus, he asked several men move the stone… Did you catch that? Jesus did not move the stone; the men did. 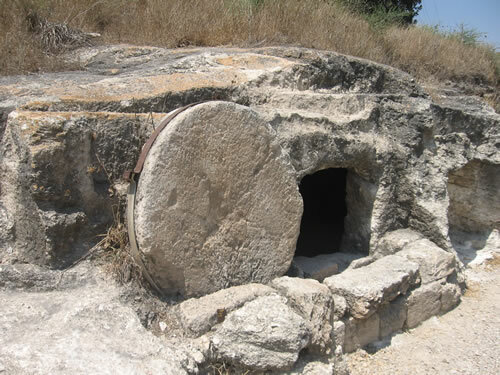 It took several people to perform this miracle: the men who moved the stone AND Jesus who raised the dead man. The men did what was POSSIBLE and Jesus did the IMPOSSIBLE. But both were needed. 1) We try to overcome it ourselves. Then when we get beaten down, we blame God for putting us in this situation. 2) We give up. We say, “What’s the use?” Or we try to escape or avoid the situation. Or we deny that the problem exists. Or we just shrivel up in a corner somewhere. 4) We ask God to help, but we don’t do what is possible for us. We ask God for healing, but we don’t go to the doctor. We ask God for provision, but we don’t give or tithe. We ask God to change our difficult relational situation, but we don’t humble ourselves to look in the mirror and to change the person we can change. We might not be able to raise the dead, but there are stones we can move out of the way. We are not able to feed the 5,000, but we can offer our lunch to Jesus. We are not be able to heal ourselves from leprosy, but we can wash in the lake seven times (like Namaan did, under Elijah’s instructions in 1 Kings). All these Biblical miracles involved both God and human beings working together. 2) Make ourselves available to the possible thing He is calling us to do.